Hey Lions fans! I don’t know about you but right about now I’m getting pretty excited about the upcoming CFL season. The tickets are paid for, the parking pass is bought (more on that below) and the training camp trip is booked. In just under a month, CFL football will be back! Across the league rosters are being filled in with free agent hopefuls and draft picks to compete with the veterans and vie for their spots on their respective teams. The Lions are no exception as they head towards the opening day of rookie camp on June 2nd and the main camp on June 6th at Thompson Rivers University in Kamloops, BC. Let’s get you up to date on the recent happenings surrounding the Lions and here in The Den, as we hit the home stretch to the 2010 CFL season. 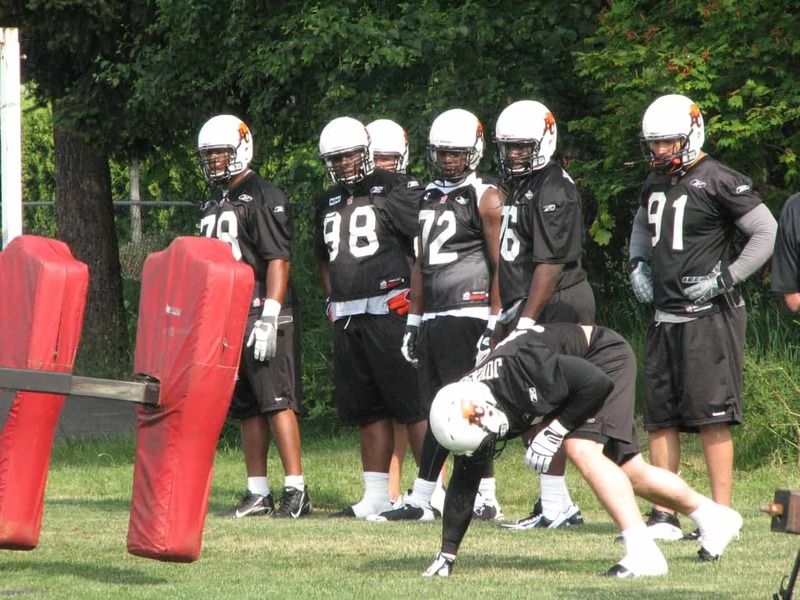 For the last two years we’ve brought you pictures and reports from training camp and this season will be no exception. We’ll have four days of “blogger style” coverage starting June 7th , running through to the 10th. We’ll have live tweets, photos, daily blog entries and possibly a live blog to see what Lions fans want to know from camp. I’ve got a few other ideas as well, but it’s going to depend if I can get a favour or two from the Lions. If you’re coming up to camp for those dates join us for a little in between session tailgate fun! Follow us here and on Twitter @BCLionsDen for information on where we’ll be. The Lions continue to fine tune their roster for training camp. The recent Canadian Draft saw the Lions stockpile nine picks in the six round draft, and the club got arguably two of the top players in the draft taking offensive lineman Danny Watkins and receiver Shawn Gore with their first two picks. The club will have to wait on them however, as Watkins will go back to Baylor for one more season, and could be an NFL draft pick. Gore recently signed a three year deal with the Green Bay Packers after successfully surviving a pre-season tryout camp the weekend of the draft. The Lions had seven other picks, and we recapped them here. The team also held a free agent camp in Portland Oregon on Mother’s Day weekend, and has one more scheduled for May 14th in Dallas, Texas. In addition to the draft picks, the team has also added depth and competition in the secondary, signing import defensive backs Anthony Reddick and Dominique Williams. The team also announced they had signed non-import and former Edmonton Eskimo saftey J.R. LaRose and local long snapper Sean Ortiz to the roster, who’s had tryouts with the Tornoto Argonauts in the past. Quarterback Zac Champion was released, leaving the Lions with Casey Printers, Jarious Jackson and Travis Lulay as the men behind centre heading into camp. Empire Field is taking shape nicely as it nears a June 15th completion date and the club has been posting almost daily photo updates from the site. Unfortunately there isn’t a lot new to see of late as the bowl is now fully enclosed by the constructed seating, and we haven’t seen many pictures from inside the walls. The project hit a minor speed bump when Logistics caused the scoreboard to be relocated from the originally planned south end to the north, forcing to club to redo seat allocations for season ticket holders. All season ticket holders will have the same view of the replay screen as they had in BC Place. 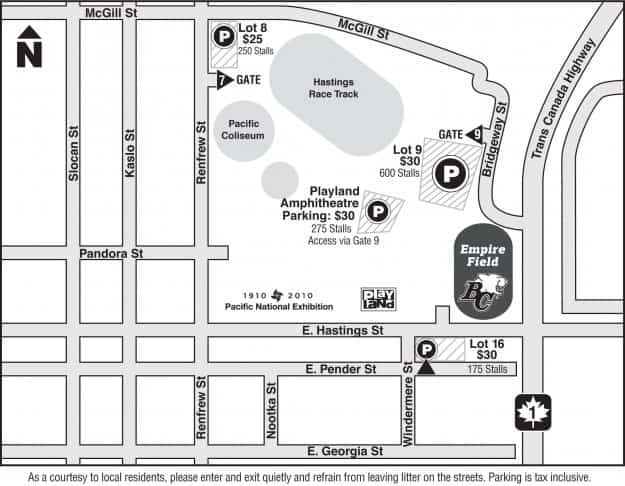 Great news came this week with word that tailgating is going to be permitted in the lots surrounding the PNE. The club and the PNE have worked out season passes for ticket holders which will give them a guaranteed parking spot on the grounds, but not a reserved spot. Prices range from 25.00/game to 30.00. and the passes are good for 9 games, but not valid on August 27th, when the PNE is on. The unofficial word from the club is that they were told tailgating will be permitted, but they are not in any capacity. This development could make this season one of the best yet for regular tailgaters, who will be able to barbeque in the shadows of the stadium, creating a great football atmosphere. Yeah the price is steep, but you had to expect it. With Playland in full swing parking will be at a premium on game days, so I’d highly recommend season ticket holders purchase the season’s pass if they plan on driving to the games. As a tailgater, it was a no brainer for me. If you’re interested in tailgating, many of the crew from our group have bought passes in Lot 9 on the north side of the stadium. Make sure your familiar with the culture of tailgating and respect the tradition. It’s a great pastime that is pretty unique to football and can really enhance your game day experience. The PNE is located in a residential area, so respect the neighborhood and it’s residents as well.